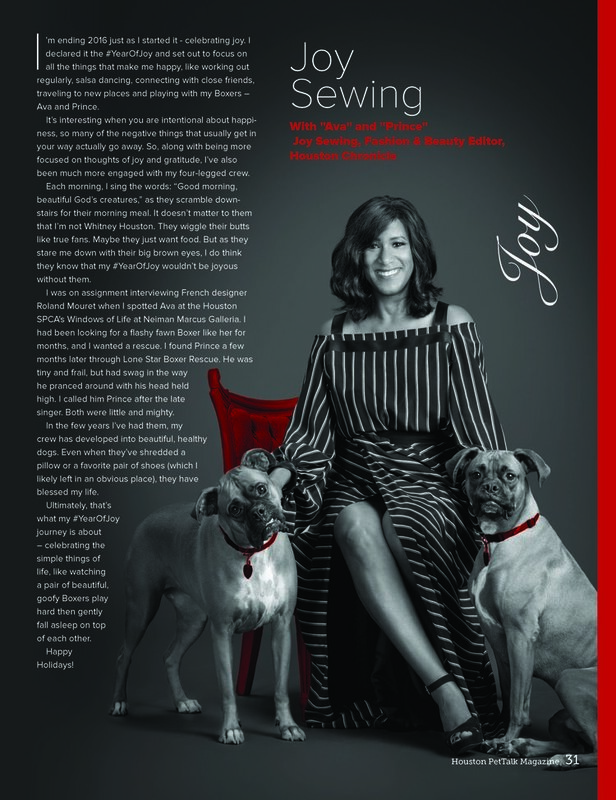 In 2017 after Hurricane Harvey, Joy was the main reporter covering the thousands of pets who were abandoned, stray or separated from their owners when the flooding waters descended upon the city. She spent days at the Hurricane Harvey animal compound, which was organized by the Utah-based Best Friends Animal Society. She took to Facebook to not only share her news articles, but also plea with followers to help those in need, including the furry friends who desperately needed fosters homes and food and supplies. Even before the hurricane, Joy was an advocate for animal safety. When Prince was savagely attacked within his own gated back yard by a pair of roaming dogs, she took to the media to talk about the city's growing problem of stray and roaming dogs. After thousands of dollars on emergency surgery to save Prince's paw and to care for wounds she sustained in trying free Prince from the attack, Joy's experience led to stories by the Houston Chronicle and other media on the issue of homeless animals and animal safety. Prince recovered like a champ. Joy's first children's book, "Ava and the Prince: The Adventures of Two Rescue Pups" is more than a sweet story for children. Hopefully, it will inspire more people to consider pet adoptions and hopefully it will fuel more dialogue about ways to help our furry friends who need homes.